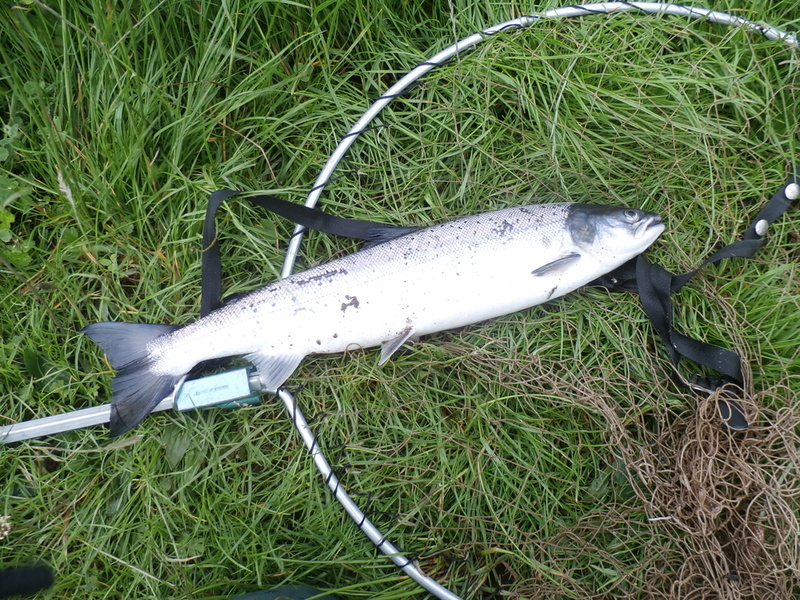 Salmon – some fish being taken throughout the whole of the Moy system, mainly grilse as you would expect. Beltra is pretty quiet with just a few Sea Trout coming to the net. Sea angling- good numbers of rays in Clew Bay with the usual shore marks producing well. Mackerel finally appearing in the are too. Trout fishing – evening fishing is steady if not spectacular on the major lakes. July is often a wet month in Mayo. 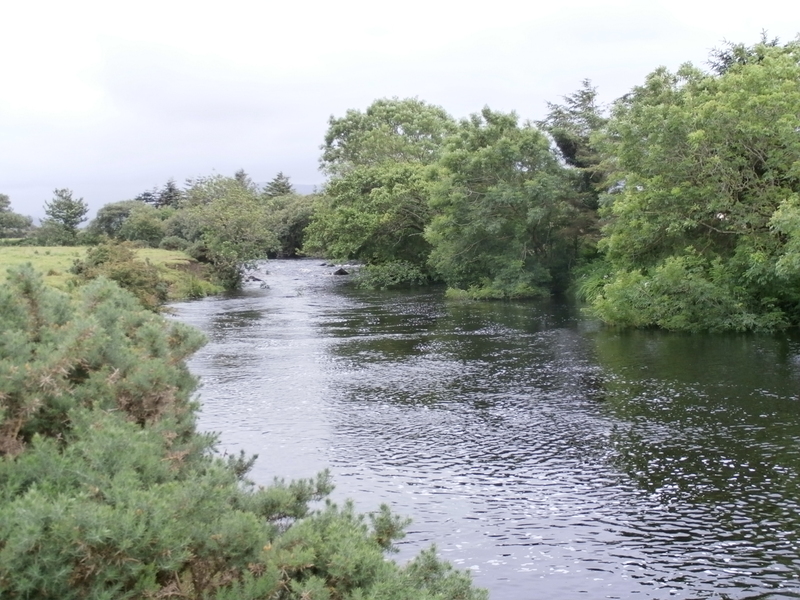 A little rain fell on Tuesday night and some more as the Wednesday morning wore on, so I decided it was worth a look at a small river I sometimes fish in North Mayo. Expecting a small rise in the water I was instead confronted with a bank high flood upon arrival. Bits of trees and other rubbish were being washed down river and I tackled up thinking I may have hit the water at exactly the right time (for a change). 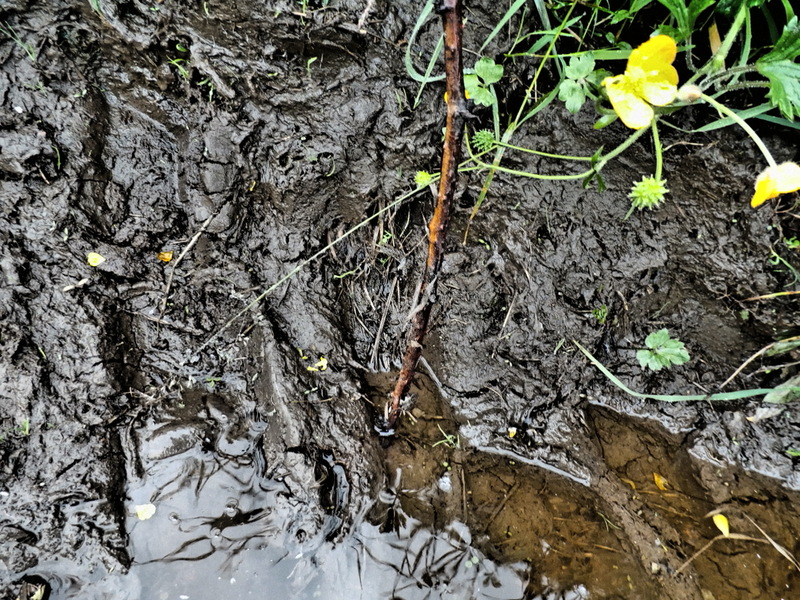 I marked the edge of the water where I entered it with a stick so I could see if the water was rising or falling. A size 8 Tailfire and a Silver Garry were first up on the cast and I edged into the stream, feeling the pull of the flow and the gravel moving beneath my feet. Due to the high water I used a sinking line to try to get down a little. The rain was lightler now so I was hopeful the river would start to drop soon. Debris in the water was a real pain in the posterior and the flies had to be cleaned every few casts. No fish were showing but that is to be expected in high water and I fished down the initial short stretch without a stir. Other anglers were now appearing as word that the river had risen passed through the neighbourhood, mainly armed with worms and Flying ‘C’s. The rain kept falling………….. I persevered for a while but the water level was still rising, albeit quite slowly. Salmon fishers will agree that a rising river is the hardest to catch fish on and today proved to be no difference. Rain further up the catchment area was still filling the river when I thought it would be dropping and any salmon who were there are running hard. The gusty wind would die then spring up again and I mistimed a cast just as a gust blew up, landing my cast in a thicket of bushes behind me. I snapped the leader trying to pull them out so I marked the spot to retrieve the flies later. My arthritic ankles are in agony (deep wading seems to upset them no end) so I decide to exit the water and get back on to dry land. It’s time to rethink tactics so I headed off to a local pub for a pint and a chat with Ben (who was also fishing). Guinness is great for relaxing the mind and after a pint of porter and a final check of the river (still rising) it was unanimously agreed that operations would cease immediately and resume early the next morning. The alarm goes off and I hop out of bed to check the weather. No water in the little bucket I keep outside the back door meaning there was no further rain overnight. There is a a thick blanket of clouds and a steady westerly breeze. 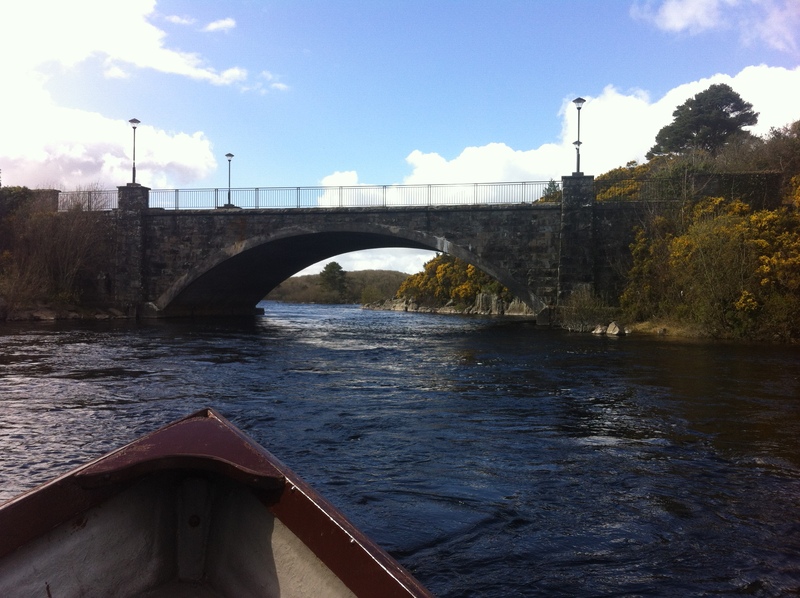 It is pleasantly warm already and my mind is made up- time to get back over to the river! Country roads are quiet at this time of the day and I make good progress through the early mist. The river has dropped almost back to normal summer level and has thankfully cleared of the floating sticks and leaves which were such a pain yesterday. I turn off the engine and start to tackle up. My jacket is still wet through from yesterday evening and it is unpleasant pulling it on. The sinking line set up is too heavy for the lower water level today so I change to a floating line and size 10 flies. Over the gate and down the lane, disturbing some cattle in the field who look less than pleased at my intrusion. More anglers appear downstream of me; it looks like I was not the only one with the alarm set this morning! I fish down a couple of pools without a touch then wade across the river and try my luck in a normally productive deep hole. A worm fisher is fishing there with a great bunch of lobworms suspended under a pike float. Gruff greetings are exchanged and it is clear he is fishless too. Cast, retrieve, cast, retrieve – the cycle continues as I fish steadily down to the tail of the pool. Still no signs of life and this is looking increasingly worrying. The flood of yesterday was sure to bring up some fresh grilse but nobody is catching them. I speak to another local who has been here since first light and we compare excuses (mine are definitely better than his in my opinion). 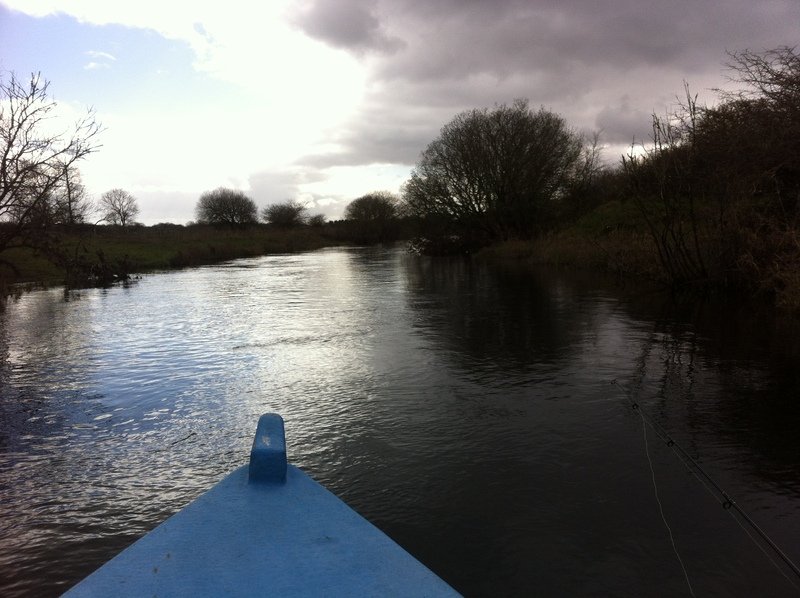 I decide to head way up river in case the fish have made a dash upstream in the high water. A short drive along some narrow, twisty roads brings me to a parking spot and I tackle up again. Swallows are darting around and a lark is high in the sky. The heavy black shape of a cormorant takes off from the big holding pool and turns towards the sea. I walk up to the top of the fishable water and start casting. I fish through the best parts of the pool and again see no signs of life at all. I reach a narrow deeper section and hook a small Sea Trout on the dropper. 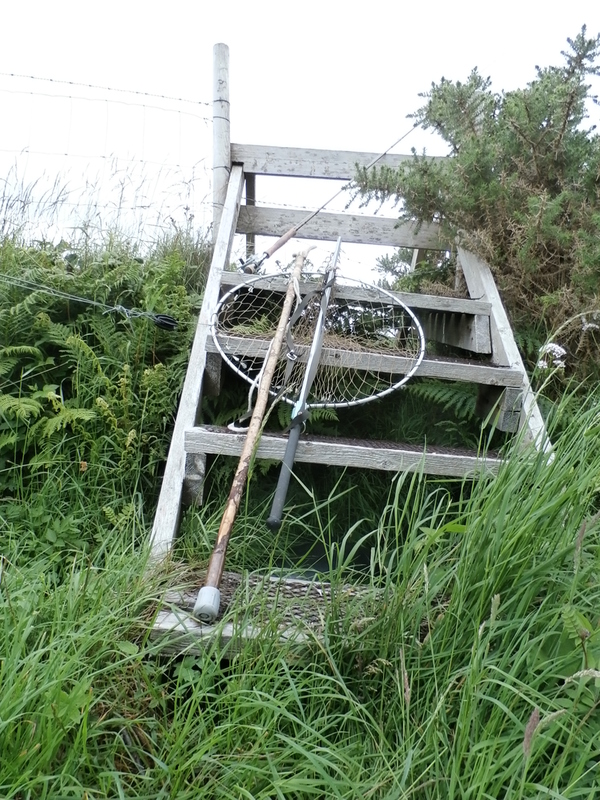 At last, something to reel in! I noticed a second sub-surface flash when the sea trout took me and presume this is another trout which has grabbed at the tail fly (I have a size 10 Black Pennel on the dropper and a size 14 Black and Gold shrimp on the tail). The Sea Trout puts up a spirited scrap but it is soon obvious there is another fish on the tail fly after all. After a minute the Sea Trout has tired and I pull him towards me only for him to shoot off in the opposite direction – what ever is on the tail is much stronger. I pull back and a fresh grilse takes to the air. This should be interesting! The fight takes longer than it should as every time the grilse tired the Sea Trout would waken up and splash around in front of him. Finally I drew both fish over the rim of the net. 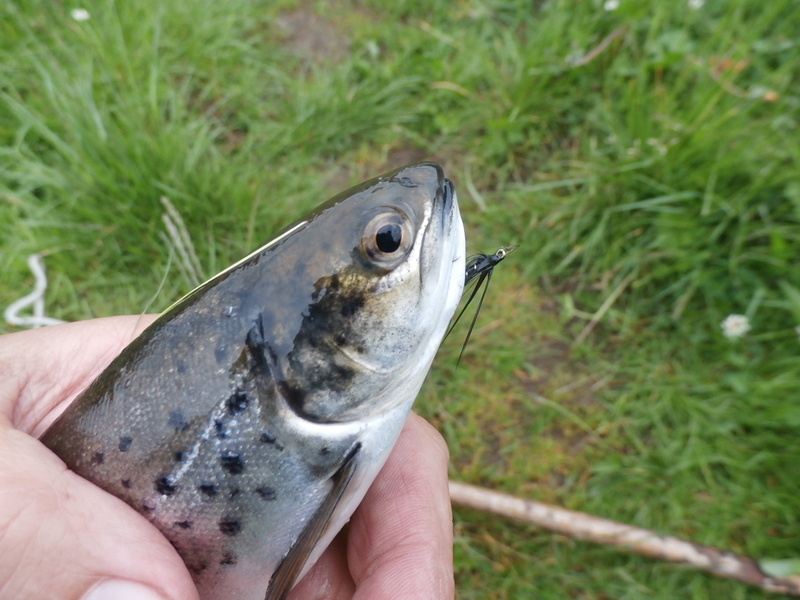 The Sea Trout was hooked under the chin and was quickly released back into the river. Mercifully there were only a few lice on him. The salmon had swallowed the shrimp and I could only just make out the eye of the hook away down the fish’s throat. A nice fresh grilse of around 4 pounds. I fished on for a while but decided it was getting a bit crowded (word had spread rapidly of my success) so I went down to a pool I like, well away from the hustle and bustle. This is a tiny wee pool which most angler walk past without realising there is a good salmon lie there. Getting into the river here requires a leap of faith as the vegetation is dense and I have to slide down a bank into the water through 6 foot high reeds. I fish down the pool without success but I am nearly back at the spot where I lost the flies last night. 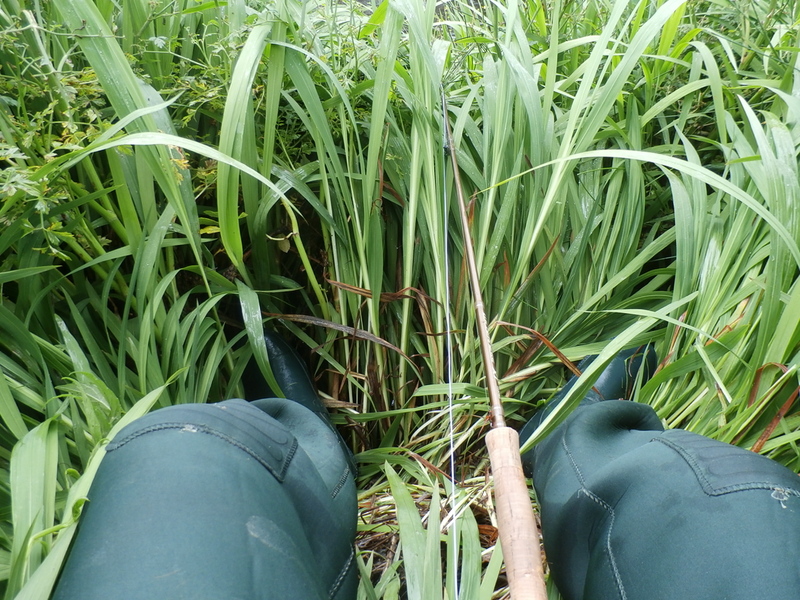 I wade across and fish down the run while at the same time looking into the dense undergrowth for my missing flies. Sure enough, I spot the Cascade first and manage to collect both it and the Pennel. Just as importantly I gather up the leader to prevent any wee creatures becoming entangled. With some pressing jobs to take care of at home I call it a day and walk back to the car. Once again the fly scored when spinner and worm failed to produce. I am convinced that the ability to control the speed and depth of the fly gives it a huge advantage over other methods. If we get some more rain I will be out with rod and line over the weekend. 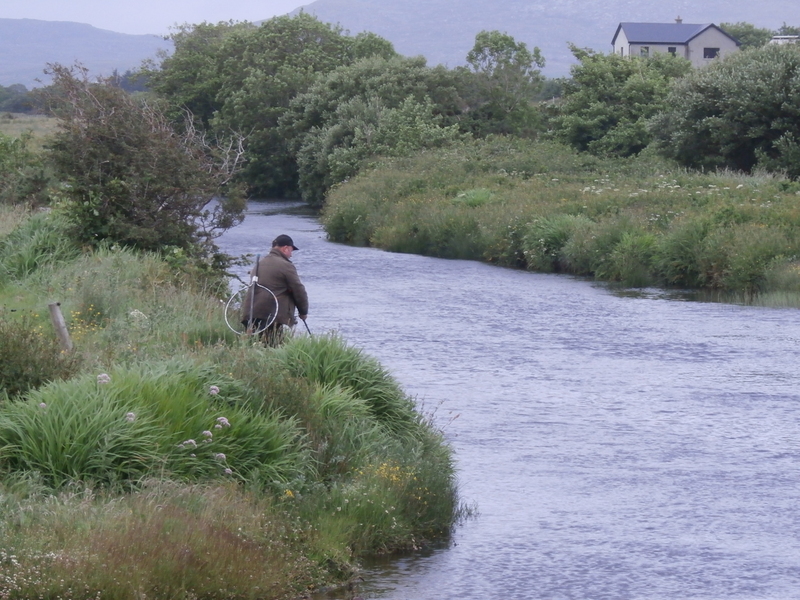 Just a few lines to update you all on the game angling in Mayo this week. 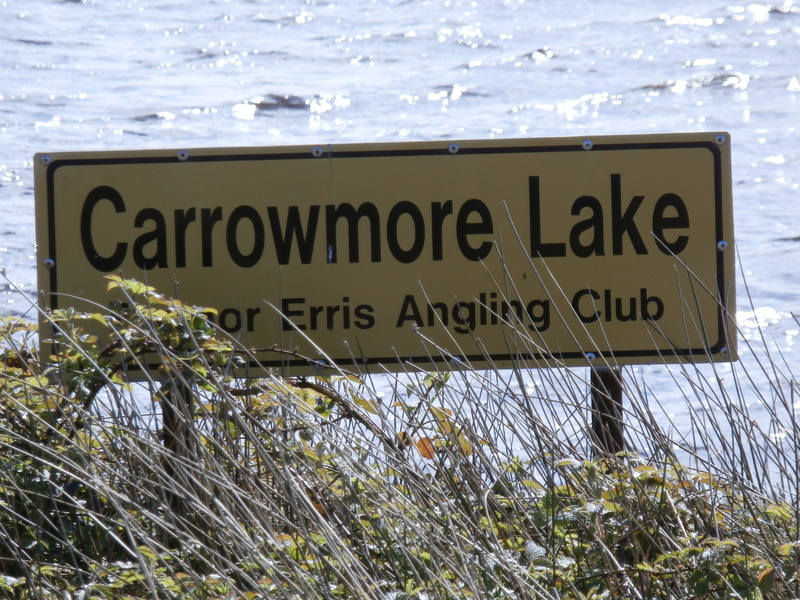 Strong winds have disrupted the fishing on Carrowmore Lake once again. For those unfamiliar with the lake a big wind, which is normally so desirable for salmon fishing on other lakes, churns up the peat sediment on the bottom of Carrowmore. The water turns an opaque brown colour and catching fish is extremely difficult. We need a more settled period for Carrowmore to deliver constant results. There are certainly fish in the system with catches into double figures on days when the boats are getting out. Lough Beltra is a bit disappointing and I heard of some very experienced rods who fished it this week without meeting a single salmon. There are a few in there, so it is a case of putting in the hours. 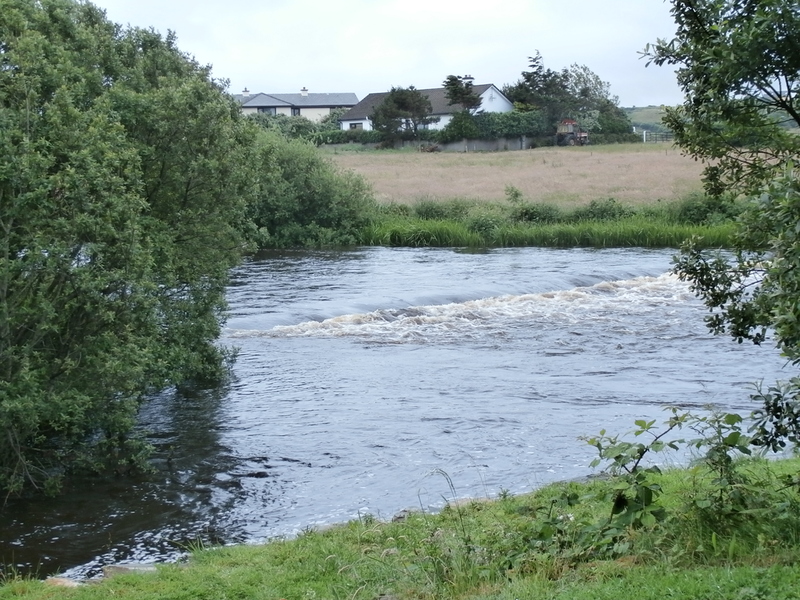 The River Moy rose and slowly fell this week and salmon were landed the length of the river, many in the 8 -12 pound class. The level is back to normal again and we await the next flood to bring in a substantial run of grilse. One angler had 2 grilse on the fly on the East Mayo waters this week but worm and flying C accounted for most of the remainder. Loch Conn is producing a few salmon on the troll and to the fly. The top part of the lough seems to be fishing better than the Pontoon end. Cullin is beginning to weed up pretty badly in some areas. 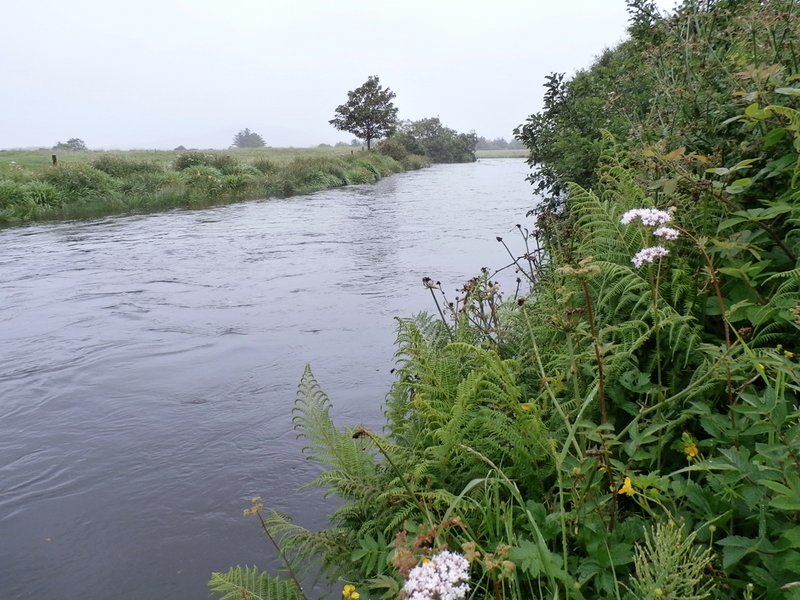 The Ballyvary River benefited from the recent rain and a small run of salmon penetrated as far upstream as the castle where a few grilse were landed. I will add some more information early next week once I have had a chance to get out with the rod myself.